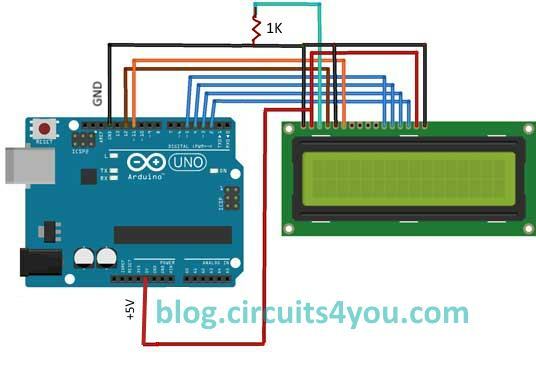 In this tutorial we’ll be looking at how to connect interface parallel LCD to an Arduino. 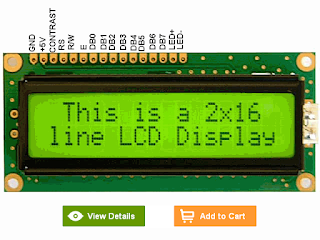 We are using 16 char x 2 Line LCD known as 16x2 LCD, you can usually identify this display by the 16-pin interface. You only need to solder 10 of the 16 wires to use the LCD, but this will only enable you to use the 4-bit interface. 4-Bit interface helps us to reduce required IO lines, there are various displays available such as 16x2, 16x4, 20x2, 20x4 LCD Display. 2. Contrast setting, LCD contrast can be adjusted by setting proper voltage at Pin 3. Connecting variable resistor takes lot of space and possibility of setting wrong contrast value due to change in resistance with change in atmospheric condition. I use 1KOhm resistor between GND and Pin 3. It gives perfect contrast setting.